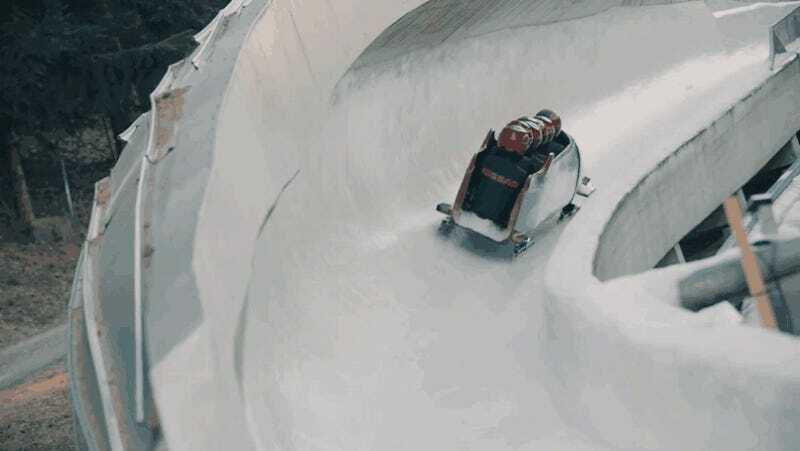 Bobsledding usually comes in two flavors, two-person or four-person. That’s it. Nissan looked at this paradigm, and completely rejected it in favor of a much crappier version. “What if we upped it to seven people?” they surely thought. What if indeed!!!!!!! The actual relevant part starts around 0:36 seconds in, because the entire beginning of this video is just a crappy ad for a Nissan, which no one really cares about, and which I encourage you to willfully disregard. But just look at that horrible ice monstrosity banging around the track like the touring van for Sweden’s crappiest alt-metal band. Nissan’s all like “oooooh, it’ll top out at 65 miles an hour!” as if that’s supposed to impress us in a world where these things regularly top 90 MPH. I know next to nothing about bobsledding, admittedly, and yet I can tell you that this is a visibly bad bobsled. I applaud you, Nissan, for having the kind of goofy engineers that will think about combining the Winter Olympics and a bus, and no further than that. But this is just hilarious.